How do I open a terminal in the current location? Are there extension for Nautilus to add these kinds of features? Or maybe a different file manager altogether. I know I can still use Dolphin but that doesn't integrate very well. Not the answer you're looking for? Browse other questions tagged nautilus or ask your own question. How can I copy the current path from Nautilus? How do I type a path or URL directly into Nautilus? How to open the terminal from a folder by function key press? Remember “Open location” for next time? How can I get something like Nautilus's “spatial” behaviour in 11.10 and later? How can I stop Nautilus from dereferencing symlinks? How to open terminal inside a folder in Nautilus, so that the folder is the current location? 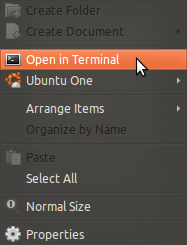 Quick way to open terminal in current folder in nautilus? How to open in terminal directory in opened in the most current nautilius window? How to open Nautilus directory in current Terminal? How can I install nautilus in Kubuntu 17.04?